Ballroom dancing is “in” like never before, with scores of new studios, both for adults and kids, opening everywhere across the US, and people of all ages joining in the fun. So is it just a hype propelled by the popular shows like Dancing with the Stars, or is there really something special about ballroom dancing that just keeps so many people coming back for more? 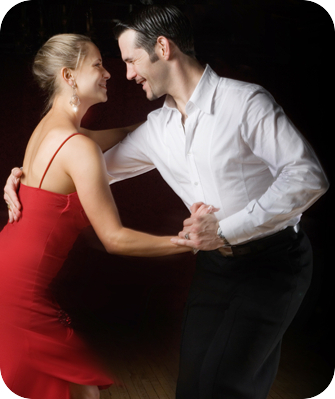 The secret is simple: for many ballroom dancing becomes a lot more than a hobby or a fun pass time. Dancing turns into a new lifestyle filled with events, friendships, excitement and to top it all off a slew of heath benefits! 🙂 Check out all the reasons why ballroom dancing may be just the thing you need to try out for yourself. Few activities can be as cheerful and exciting as ballroom dancing. Low energy, sadness and lack of spirit have no place on the dance floor. While you will need to practice and concentrate in the beginning, instruction will happen in a fun, lively atmosphere; you will be surrounded by happy, smiling people and awesome music. Once you learn how to dance, it will be sheer fun and joy. The beauty of ballroom dancing is that it really brings people together. It is a great opportunity to make connections with people in a low-pressure environment, where there are no expectations. You will meet interesting people you would have otherwise had no chance of meeting. The best part is that they will all share in your new passion for ballroom dancing, and this common ground is often the beginning of lasting friendships. Among ballroom dancers, there is a real sense of community that is not only fun, but is also supportive, warm and welcoming. This entry was posted in Benefits and tagged What are the benefits of ballroom dancing, why ballroom dance?, why ballroom dancing trumps other activities. Bookmark the permalink.